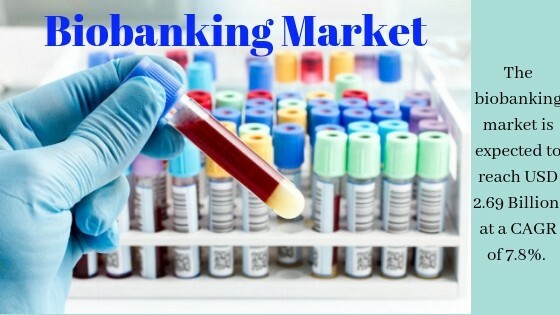 The Biobanking Market is projected to reach USD 2.69 billion by 2022 at a CAGR of 7.8%. The Market Research on Biobanking, By Considering useful aspects like; Application, Sample Type — Global Future Forecast till 2022, published by MarketsandMarkets™, the report studies the global Biobanking market over the forecast period to 2022.Based on product and services, the biobanking market is segmented into equipment, consumables, services, and software. The equipment segment is expected to dominate the global biobanking market during the forecast period. Increasing number of biobanks and rising number of biosamples that need to be stored are key drivers for this market segment. The biobanking market has been segmented by application into regenerative medicine, life science research, and clinical research. Regenerative medicine is the fastest growing application in the market. Growth in the number of research activities in this segment and the increasing demand for well-annotated, and quality biosamples is fueling the growth of the market. · Biobanking Market, By Sample Type. · Biobanking Market, By Application.